Since the invention of Serato, creating the perfect break record is a lost art form. In the twenty teens break record releases are few and far between for vinyl purists. DJ’s and producers alike rely on instant access to curated sound libraries bypassing all the junk. Breaks For Hire is the immediate tool for the job. If you’re a DJ looking to build a potent battle routine for the recent wave of 45 only nights or the producer in search of the ideal break exclusive to vinyl, this record will keep the productivity seamless. Carefully assembled by DJ Mekalek, this 7” scratch/break record (plays at 33RPM) is packed full of phrases, skipless kits and even a side of ultra-rare drumbreaks supplied by legendary rap producer K-Def. 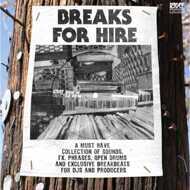 Breaks for hire is ready to work for you.